The textures in the Silent Hill HD Collection aren't quite scary enough for the original games' art director. 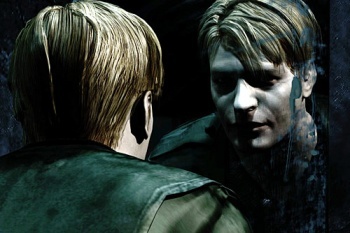 Between passively evil small towns, Euclidean lunatics with gigantic swords, and tragic backstories coming back to haunt protagonists, there are some pretty scary things in the Silent Hill series. For Masahiro Ito, the art director of the first three Silent Hill games, the scariest thing about the recently released Silent Hill HD Collection on PS3 is a screenshot. When a fan on Twitter showed him a side-by-side comparison of the HD Collection games compared to their PS2 counterparts, the art director was not amused. According to Ito, the PS3 itself deserves some of the blame for its texture processing, but he remains incredulous that Konami would re-release an eleven-year-old game in such a condition. The fan in question sent Ito a side-by-side screenshot comparison of two characters standing by a waterfront with fog obscuring the background. While in the original PS2 version, the fog rests atop the water and creates an eerie atmosphere, the HD Collection port presents a relatively clear view of the environment, only fading into the mist as the water meets the horizon. "I guess that it was a problem of PS3. PS3 has a weak point for using 'translucent texture,'" tweets Ito, where "translucent textures" refer to features like fog and mist. Aside from his analytical comments, Ito also tweeted his displeasure with the screenshots' quality: "It's poor ... It's really a released version? Really?" While Ito has suggested a patch for the graphical issues, the PS3 does not process textures the same way that the PS2 does. In practice, this means that a patch would likely require more time and resources than Konami is willing to put in, as it would require a graphical overhaul. Based on the screenshots, the Silent Hill 2 portion of the HD Collection definitely has some visual issues, but do these take away from the game as a whole? If nothing else, it's probably much harder to be scared by the sights and sounds of Silent Hill when there's no dense layer of fog to hide them.